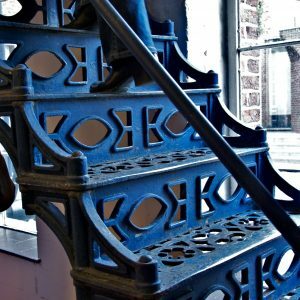 Reclaimed in old brewery in northern France, this straight staircase reflects undeniably the industrial period. 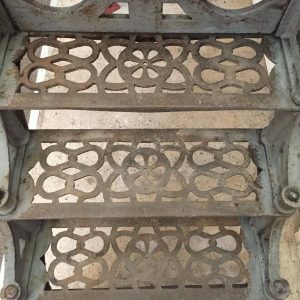 Cast iron staircases are known and famous for their spiral models. 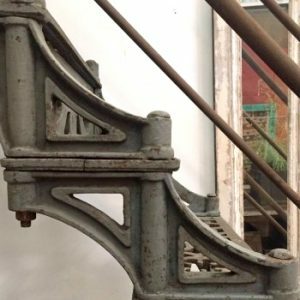 This straight staircase is one of the few known models in cast iron, knowing that mostly the treads are bolted in between two stringers. Remarkably this type of staircase is also found as hélicoïdale version in lighthouses all over the world. The staircase is available in two versions: with and without riser. 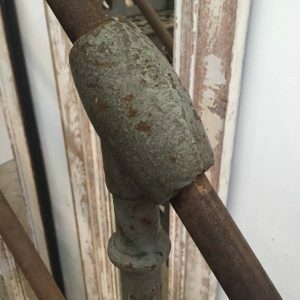 The height of the staircase can be determined by accumulating the number of treads needed to reach to the according level, knowing that the height of one tread is 20cm / 7,874 inch / 0,656 feet. The external width of the staircase is 802mm / 31,5 inch / 2,624 feet. 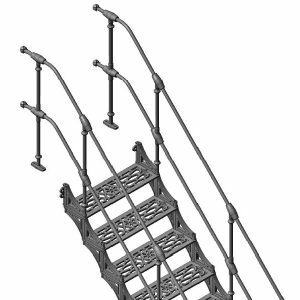 The total weight of the staircase can be determined by multiplying the number of treads with 30kg (without riser) or 43kg (with riser). The staircase is delivered in raw loose parts without finish. 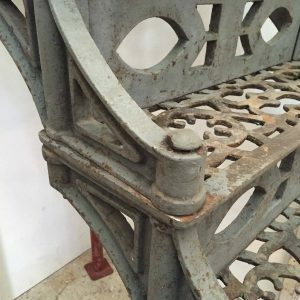 It is up to the client to choose the desired finish: either to keep the raw appearance of the metal, to wax or to paint. A (metal) wax or matt paint (anthracite grey or black) can be ordered and delivered with. Indicate the height (in cms) between the two finished floors.